If you’re an Omaha foodie who believes as many do the local dining out experience has never been better, then you can thank an infusion of original chef-driven and chef-owned eateries for it. Not coincidentally, many of these places are steeped in the locally-sourced, organic, farm-to-table, artisan, and made-from-scratch movements. Classically trained culinary artists have built relationships with area growers and producers, in some cases designing seasonal and even daily menus around what’s at its peak of freshness and flavor. Grey Plume chef-owner Clayton Chapman, a strong adherent and leader of the sustainable model, says there are about 50 grower-producers he works with on a regular basis. The Omaha research and design collaborative, Emerging Terrain, helped bring chefs and purveyors together at two events; 2010’s Stored Potential’s Harvest Dinner and 2011’s Elevate, which some point to as tipping points. The Nebraska Sustainable Agriculture Society holds similar events, including the annual Producers Choice and monthly Sustainability Happy Hour. Metropolitan Community College’s marriage of its well-ranked Institute for Culinary Arts with its Horticulture Department is considered cutting-edge. MCC instructor chefs like Brian O’Malley champion a local foods infrastructure. ICA graduates permeate the local restaurant scene. Chapman took things to the next level with his Grey Plume Provisions store which opened last summer. The sustainable, farm-to-table culinary ethos is nothing new. It’s been around since the time of Escoffier, but largely dissolved in America, only to be rediscovered by Alice Waters in California in the late 1960s-early 1970s. In Omaha the trend never quite took hold until recently. Now local chefs such as Chapman, Kulik, and Bryce Coulton of the French Bulldog, are earning national attention for their rigorous and creative applications of old and new philosophies. “It’s really supply and demand,” Chapman says. “It’s the demand of chefs because we want the best ingredients available. We want to know where our ingredients are coming from. We want to know the farmers, ranchers, and growers raising these products. I think there’s a lot of guest requests for us to procure these items. They want to see them on the menus, too, and it’s because the dining public has never been as educated into what they’re eating, and the health benefits of eating organic, local, or seasonal as they are now . Whether Omaha truly has a signature culinary culture is debatable, but what’s not is that a city long pegged as a steakhouse town, albeit with some continental fine dining spots thrown in, has changed its profile. It’s hard imagining Omaha has ever boasted this depth of culinary talent and diversity of highly executed cuisines before. This critical mass of good food, served in settings that range from fine dining to ultra-casual, and found in virtually every part of the metro, comes just as customers are more discerning and demanding. Omaha is developing distinct dining districts to complement its one holdover, the Old Market. A local food tourism industry is in sight as Downtown, Midtown, Dundee, Benson, South Omaha and West Omaha roll out ever more interesting restaurants and food stores. It’s a happy convergence of trends for diners, who have far more good options today than even five years ago. There is promise of more to come as some sous chefs and line cooks working at top end places invariably launch their own concepts. “Because you are seeing more and more Omaha restaurants worthy of that type of apprenticeship or up to that sort of training challenge, it really creates a kind of self-sustaining circle of chefs,” Chapman says. He suggests the culinary evolution has caught up with the arts-cultural-entrepreneurial growth that’s witnessed a more confident, vibrant city. “About 20 years ago the conversation around town amongst people who cared about cooking and restaurants was whether Omaha was ready for this or for that. Fifteen years later we opened the Boiler Room and that conversation hadn’t changed one iota. The reality is, much like any professional field, it is incumbent on the professionals to maintain the highest level of continuing education, curiosity, development, enrichment, energy, focus and drive to keep the conversation moving forward. His declaration of principles, or food manifesto, is shared by many. “We’re trying to update the dining culture to make it so that it’s kind of entered into the 21st century and in some ways returned to the 19th century, which is to say going back to real products,” Kulik says. Bryce Coulton, whose French Bulldog has won awards for its charcuterie, brought authentic influences here from training he did abroad. He’s bullish on the quality of diverse culinary traditions available. Bosnian native Dario Schicke, chef-owner of Dario’s Brassiere and Avoli Osteria, has seen a big difference since moving to Omaha in 2002. Kukik describes the benefits a diner like himself experiences at a place featuring this considered, well-articulated approach. “A lot of Italian restaurants got away from using real, authentic, high quality ingredients,” says Schicke. Fine dining can be found at select steakhouses, French and Italian restaurants and Asian spots. High concept casual places, especially those doing killer fresh, from-scratch comfort food, abound. Chefs, along with veteran area food writers Nichole Aksamit and Summer Miller, say the real difference from then to now are the new chef-driven and chef-owned places that display an enthusiastic, even obsessive embrace of well-prepared fresh foods that don’t skimp on technique or flavor. Free of corporate pressures, these chefs truly are the masters of their own kitchens as well as the front of their houses and therefore they can stay absolutely true to their vision and passion, including working closely with purveyors to get the best ingredients for their in-house creations. Brian O’Malley says rather than a culinary culture, there is an identifiable Omaha culinary school. Some local culinary stars are leading the way, and nearly all have come up through the ranks of Omaha’s finer dining establishments. 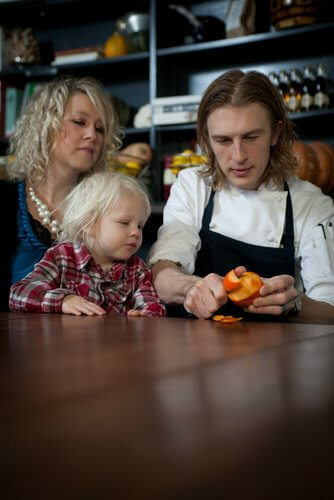 Nebraska Sustainable Agriculture Society executive director William Powers says, “Numerous chefs have really gotten behind this idea of an Omaha food culture that works hand-in-hand with local farmers who embody the idea of community and culture. Clayton Chapman at Grey Plume, Nick Strawhecker at Dante Ristorante Pizzeria, Joel Mahr at Lot 2 and Paul Kulik of Le Bouillon and Boiler Room are leaders in this good food revolution. Kulik says, “If it’s not the Boiler Room at the tip of the spear then it’s Dante. It’s people coming back in the midst of the economic downturn or Grey Plume opening and offering another white table cloth experience with an overt and extremely full-throated support for local purchasing and sustainable farming practices. It’s Bryce (Coulton) at the French Bulldog with his charcuterie program. Or it’s (chef) Joel Mahr and (owners and sommeliers) Brad and Johanna Marr at Lot 2 being a little bit fresher and more progressive in a revived Benson. Or it’s the Duggans (Colin and Jessica) moving back from San Francisco and opening Kitchen Table. Several chefs applaud the camaraderie present on the scene. Chapman says, “We’re all kind of rooted in some type of approach. A lot of what we do is rooted in French technique but we combine New American type flavors or presentations. I think it’s allowed everybody to develop their own styles but it’s also created a universal thread. It’s helped build the expectation for the guest, which is probably the most important thing. When we say Contemporary American or New American it just help gives the guest insight into what we do. The recognition some Omaha chefs have received, including James Beard nominations, can rub off on others. “I’m a firm believer in a high tide raising all ships,” Chapman says. “As one chef gains acknowledgment for a job well done, it forces the rest of the chefs to want to step up their game as well,” Coulton says. Kulik says where only a few years ago he struggled naming even a few places to steer big city visitors to, he has a ready list today. Other spots getting love include Mark’s Bistro. DixieQuicks, Le Voltaire, Laos Thai, China Garden, Taqueria Tijuana and Metro’s Sage Student Bistro. Enzo’s and Mouth of the South are new players in underserved North Omaha (Florence). “What are you in for? Where are you staying? That’s the whole point right? That there’s food to be had all over town that’s going to stay with you,” Kulik says. Omaha may be an emerging regional food destination but everyone agrees it has room to grow in terms of more markets and eateries that feature fresh products and authentic ethnic choices.